1980 – born in Kyiv. 1998 – 2004 – the National Academy of Fine Arts and Architecture, department of stenography in workshop of D. D. Lider. 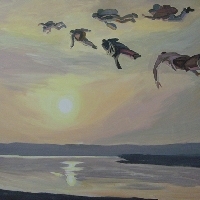 2008 – "New Ukrainian painting", Gallery "WhiteBox", New York, USA.